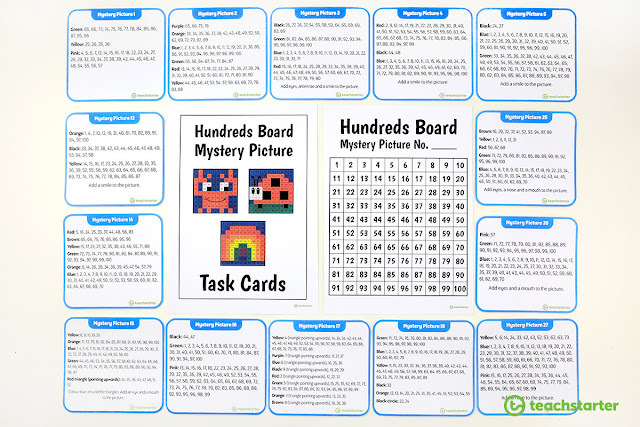 The hundreds board is one of the most fundamental mathematics resources for Junior Primary. 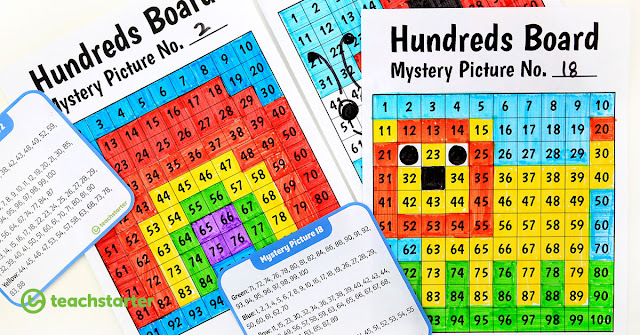 It perfectly demonstrates the base 10 number system to young children, encourages counting and makes number patterns easy to find and identify. There are so many ways to use them so I've rounded up my favourites to share with you today! Sponsored by Teach Starter as part of my Brand Ambassadorship. 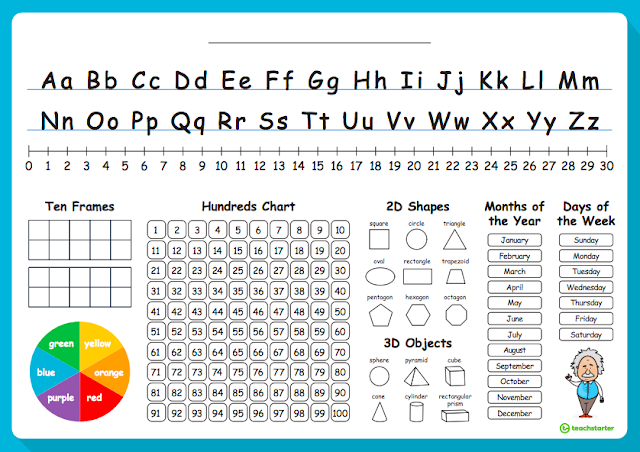 First of all let me say there are HEAPS of different hundreds charts with all different colour schemes and themes that you can get from Teach Starter. The tranquil watercolours is one of my favourites (and the watercolour theme pack has been one of their most popular too!). 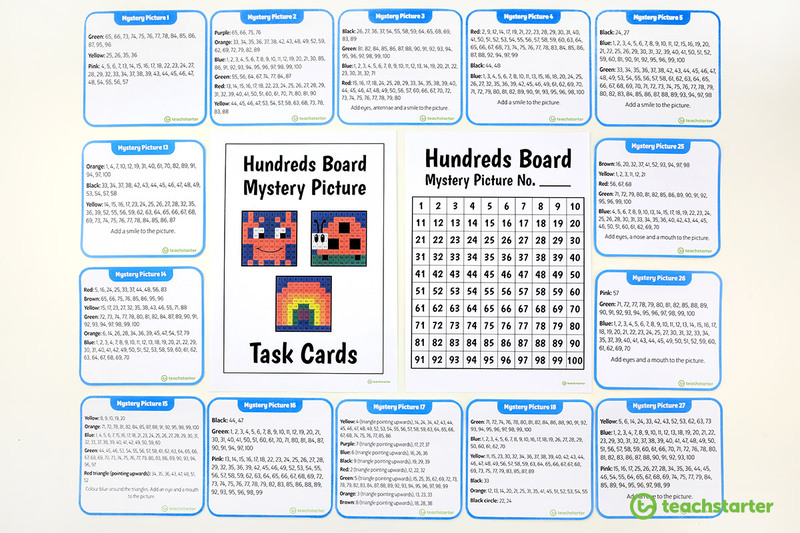 So when it comes to actually putting the hundreds charts to good use, here are some ideas for all ages! I always do this game with my Receptions in the second half of the year when they are a bit more confident and comfortable with numbers to 100. They work with a partner and all they need is a small gem or counter with their hundreds chart. One person closes their eyes, and the other places the counter over one of the numbers. The first student then opens their eyes and has to guess which number is being hidden by looking at the numbers around it. They can continue taking turns and this usually keeps them busy for 5 - 10 minutes. This game could be played with the whole class, in small groups or with a partner. One person is thinking of a number (to make it harder it could be any number on the chart, or to make easier, give some guidelines e.g. a number between 20 and 40). Then the class/group/partner has to try and guess the number. Cross off each number is guessed to help them keep track of where they're up to. A great way to practise "higher and lower" too! Giving your child (or students) a blank 100 chart and asking them to record as many numbers as they can, gives you a fantastic snapshot into their understanding of number. You can see how far they can go, can they self correct if they see an error with the number pattern? Are their numbers accurate (are there reversals, are any numbers inverted e.g. 21 for 12)? 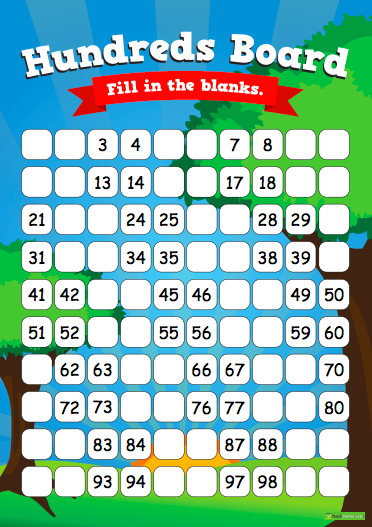 For a slightly easier version like this example, the students are given some of the numbers and they need to fill in the missing ones. This will help them to keep on track with the pattern. I think this is such a brilliant idea! All you need to do is print or photocopy your hundreds charts in two different colours. One sheet remains in tact and the other is cut up in various ways. Students could cut horizontally keeping the numbers in groups of 10, or vertically to look for number patterns. They could even cut the chart into all different sorts of shapes (as long as they stay along the lines) to create their own puzzle. Or a puzzle for a partner to complete! What an awesome Daily 4 maths activity! A really important skill we teach in the Early Years is to begin counting from various starting points (e.g. not always at 1). 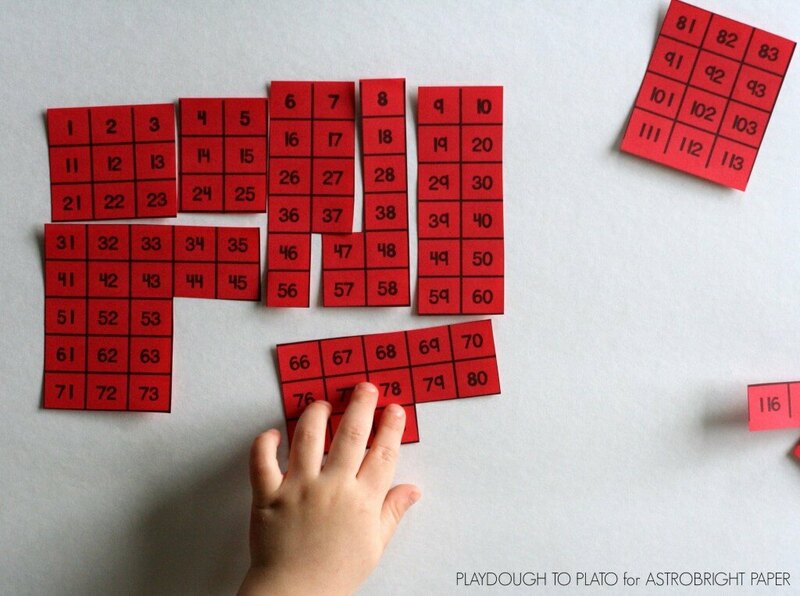 Because if children can do this, it helps them later on with addition and counting on. 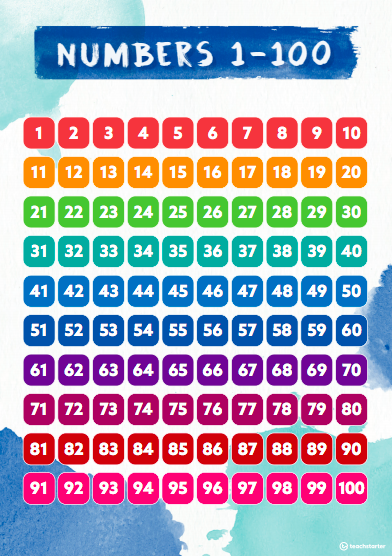 With the aid of a hundreds chart, you can guide your students to the number you want them to start counting at. They need to find it, follow your instructions as to whether you want them to count forward or backwards, and stop when you instruct them to. This is currently where we are at with Miss M and her understanding of number. She is really confident at counting, but always hesitates when she gets to 29, 39, 49 etc as she struggles to remember which of the decades comes next. I've printed out an A3 hundreds chart, laminated it and stuck it in her bedroom for her to practise. 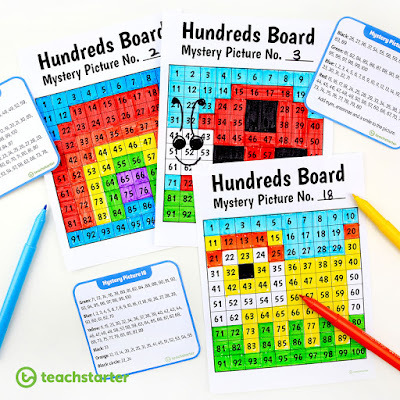 I am so excited about these BRAND NEW mystery picture cards that Teach Starter has just released. Students need to follow the code on the card, and colour in certain numbers in the right colours to reveal the mystery picture. There are 32 of them all together! So awesome! Children usually learn about odd and even in Year 1, and colouring in all the odd numbers in one colour and evens in another colour is a great way to practise and once again (I must sound like a broken record) look for the number patterns! There are just so many to be found!! 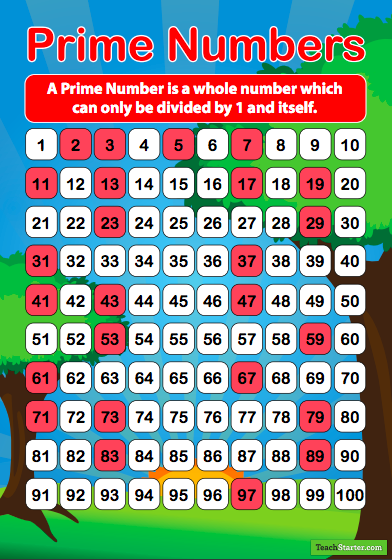 For older students, Teach Starter has created these prime and composite number posters for students to refer to at a glance. It's a tricky concept to grasp, so your visual learners will find this resource especially useful. Ideal to place on your maths "working wall". For children to be able to refer to their hundreds chart at a glance, it's a great idea to include it on their desk mats. Teach Starter has created this one with heaps of other useful information that your students will be constantly referring to throughout the day. 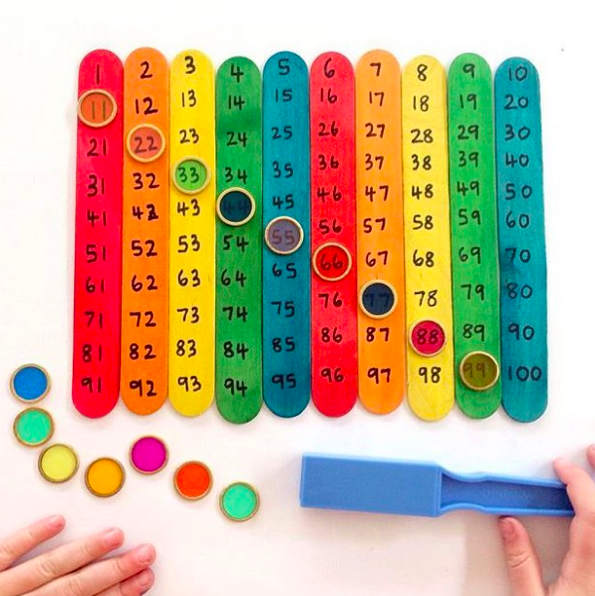 One final idea I found by Cinta and Co on Instagram is to create your own hundreds chart using popsticks for each columns or row. Such a brilliant idea with lots of possibilities. Great for Year 1, 2 or 3 I'd say. 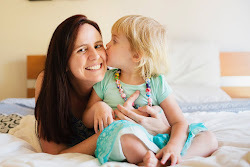 I read this really interesting article by The STEM Laboratory about why we should teach young children beyond 100 (it's also where I found some of the ideas I've shared today!). I had never really thought of it this way, but when you think about it, lots of children think that 1001, 200 or 110 are the numbers that comes after 100. Or some may think that 100 is where numbers stop. Have you got any ideas to add? How do you your hundreds charts?